Our 4-day Leadership Training Retreat is right around the corner - in a week and a half! We love this intensive because the retreat format gives us the chance to immerse into the concepts and practice of social justice and community-building while deeply exploring injustices and the conditions that cause them. We have an awesome group signed-up this year and we can't wait to embark on this collaborative, eye-opening, heart-opening journey together! Joining us again this year is the wonderful Jacoby Ballard, a long-time yoga and Buddhism teacher, herbalist, health educator, social activist, and co-founder of Third Root Community Health Center in Brooklyn, NY. He has taught yoga in queer and trans communities, to survivors of sexual violence, to people recovering from addiction, to homeless folks, and to everyone else. We asked him to share his thoughts about this training, why it's important, and why he loves being a part of it. Jacoby: This training is for all of us who want to make a better world, a more loving, honest world, increase access to education and healthcare, decrease incarceration, increase well being for all. We all need a tune up and retreat held by the threads of social justice and embodiment, kindness, and integrity. This training is for those doing social justice work-to slow down and catch up with your heart and body; this is for yogis who don't know how to help, but look around themselves at the world and know that they must. This training is to gain more skills, be held by facilitators and teachers who are decades-deep into this work, and to be present in mind, body, and spirit in the process. WHY IS IT IMPORTANT TO DO A TRAINING LIKE THIS IF SOMEONE WANTS TO DO COMMUNITY ENGAGEMENT? Jacoby: It is important to understand all the underlaying dynamics of how we got into this mess over centuries, who the players were, who it benefitted, who you might represent to those you are trying to serve, what the gaps are in your knowledge of the issues at hand, and what resources are already available and brilliance that we can all already lean into that has built every social movement and resistance struggle. This is the ground that we step into as people trying to make a difference, trying to heal, trying to show up, and we are bound to make cavernous mistakes if we don't educate ourselves-not once, but again and again and again, constantly learning the deeper and deeper layers of history. 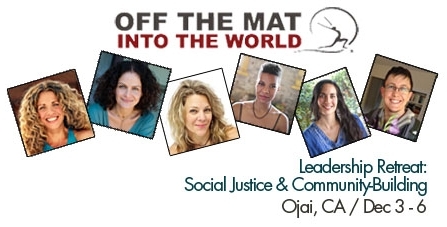 WHY DOES OTM OFFER YOGA AND SOCIAL JUSTICE TRAINING TOGETHER? WHAT’S THE BENEFIT? Jacoby: We need to do the inner work to understand our own history, positionality, triggers, and vision; and we need to do the outer work to create the world we want to live in, a world that every being wants to live in. Liberation is both individual and collective-it can never be one or the other. A huge benefit of this training in particular is finding your people, people to network with, to rely on, to count on, to learn from-a piece of the Beloved Community that Martin Luther King Jr. spoke of. WHY ARE YOU PART OF THIS TRAINING? Jacoby: I am part of this training because this is what I do, build bridges between mindfulness and social justice, between anger and action, between grief and creativity. I believe that the changemakers need to be healthy if we are in it for the long haul, and that yoga is a deeply revolutionary teaching. If we all who practice asana truly lived the teachings of yoga, the world would be transformed and our bodies would be nourished.